Lawmakers are proposing new restrictions, which could reduce the risk of serious or fatal watercraft accidents involving residents and tourists alike. In an effort to reduce the number of Fort Myers watercraft accidents, legislators are trying to change minimum age requirements, as well as the penalties for criminal behavior in water sport activities. Our Cape Coral personal injury lawyers understand the dangers involved in operating water sport machines like jet skis or small motor boats. The News-Press recently reported about the proposed bills in the upcoming legislative session. Bill 370 is proposing the minimum age to operate a personal watercraft be raised from 14 to age 16. It would also require anyone born on or after January 1, 1988 to have completed a boating safety course and acquire a boating safety ID card in order to operate a watercraft such as a Jet Ski or a WaveRunner. The bill’s proposal follows the death of a young boy who crashed into a dock while operating a personal watercraft. 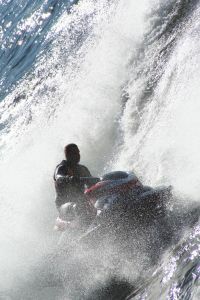 The Florida Fish and Wildlife Conservation Commission reported 149 injuries and 7 deaths in Florida in 2008 as a result of personal watercraft accidents. In 2009, there were a total of 143 watercraft accidents which resulted in 152 injuries and one fatality in the state. Lee County reported no fatalities during these two years but did have 10 injuries sustained in 15 watercraft crashes. Collier County reported 11 crashes totaling 13 injuries but no fatalities during the same time period. The other proposal, Bill 512, would eliminate criminal misdemeanor penalties for violating navigation rules which don’t involve reckless operation but result in an accident. The new bill would impose fines for navigation incidents that cause accidents that do not involve carelessness or alcohol involvement. The fine would be up to $500 for first offense, up to $750 for a second offense, and $1,000 for all other offenses. The new age law would not restrict tourists from participating in watercraft activities. If a renter does not have the boating safety ID card they can take the course onsite for $3 and still boat the same day. Water activities can be loads of fun but operators are reminded of the dangers that could ensue. If you have been the victim in a watercraft accident, seek legal advice immediately to discuss your rights. Associates and Bruce L. Scheiner, Attorneys for the Injured, is a law firm dedicated to representing accident victims in personal injury and wrongful death claims in Fort Myers, Cape Coral, Naples, Port Charlotte, and Sebring. Call for a free case evaluation at 1-800-Dial-BLS (800-283-2900).